Valentine's Day card made with a digi image from the House Mouse Triple CD set from the Joanna Sheen on line store. Cut out image and saying with Nestabilities dies. Cut out the scalloped square card base with my Silhouette Cameo and a svg file from The Cutting Cafe. Stitched polka dot and flower paper to card base with my sewing machine, then added lace, flowers and pearls. Such pretty pinks! I am in love with that dp, and the gorgeous little pink roses! Super sweet! Lovely card and the image is just adorable. Thanks for taking time to play with us at Mema's Crafts. Very sweet image for Valentines Day. Lovely layout and beautiful soft colors. Thanks for joining us for the House Mouse and Friends Monday Challenge. So cute! I love these Mice and I better start using mine!! Good Grief! This is soooo cute. So loving the extra soft elements like the pearls and feminine colors! I love this image and you did a fantastic job showcasing it with your pearls, papers and scalloped card base. The flower and lace make for very nice embellishments. Thanks for playing along with us here at House Mouse & Friends. I like the polka dots and floral print pattern together on this card. To me that just screams "Valentines!" Such a sweet card. Adorable image, and wonderful colors. Thanks for joining us at CFAS this time around. Hope to see you again. i love the image!! so cute!! 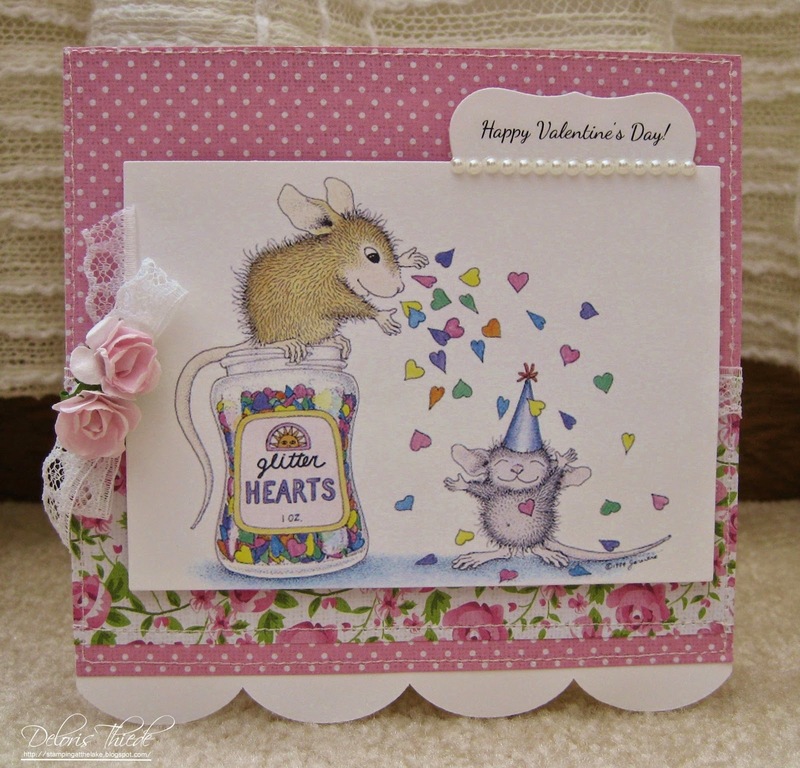 This is a gorgeous card, such an adorable House-Mouse image and such pretty pink papers. Thank you for joining us at House-Mouse and Friends Monday Challenge. An absolutely adorable card! I love this image, and you did such a great job using it!